We left some ashes of Gypsy and Clyde at Minnewaska State Park. We loved hiking there with them. 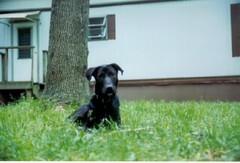 Gypsy loved to swim in the lake; it was where we discovered she was a great swimmer! So we scattered some ashes in the lake, and threw some others off a lookout cliff. Allan left little piles on a high stone with a beautiful view of the lake. I told Buster that he must live forever, and that's final! He's very obedient and always wants to please me, so we'll see. What are you doing to help defeat W? There are many ways to be more involved. Please do more than vote. Please. Just back from ten days of relaxing in the country, I am dying to check the Buffalo Consulate website to see if there have been any updates, I click on the link and... nothing. Applications to emigrate to Canada from the US are processed at the Candian Consulate in Buffalo, NY. Buffalo's website had a page called "status of applications", on which it said something like: "We are now creating applications from forms received in in May, 2004 ... We are now processing applications created in October 2003." This was my only clue of how long the current wait time is. And they took it away! Now what will I obsess over? Of course the status of our application is only channel one of my three-pronged obsessions. The other two? Do you even have to ask? I had another letter in the NY Times this week. I wish it was this easy to get all my writing published! You can read the letter here. we make faces at our dogs. note clyde staring at squirrels. 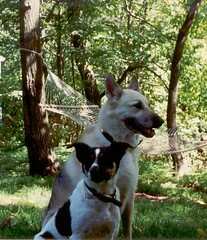 This is our last summer going to the Catskills with our dogs. I'm not sad about it – I'm sure we'll find some wonderful place in Canada, hopefully a cabin in the woods, maybe near a lake – but it does feels momentous. 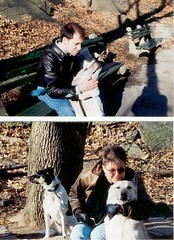 I still get wistful and nostalgic about our time upstate with Gypsy and Clyde. We started going to the Catskills because Gypsy couldn’t tolerate the Fourth of July fireworks. It got worse every year, until she actually got sick from the stress. But we knew from shorter excursions that she also had extreme motion sickness, so we didn’t know what to do. Finally we felt we had no choice. We had to sedate her for the car ride and get out of town for Fourth of July weekend. I love the woods and we both hate the beach (at least in summer), and the Catskills are beautiful, quiet and nearby. 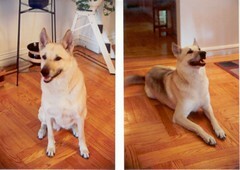 I read about a bed & breakfast that encouraged guests to bring their dogs, and we set out for Fleischmann, New York. This was 1993. Much to our surprise, Gypsy had outgrown her car sickness. The bed & breakfast itself wasn’t great (if you're going to invite dogs, you can’t also worry about all your priceless antiques and valuable rugs, no? ), but more importantly, we discovered we could travel with the whole pack. In Fleischmann we found an efficiency motel, and that was our move for the following year. It's funny to think we stayed in a little motel room with a tiny efficiency kitchen and a sort-of porch, just big enough for our two chairs. We would tie the dogs' leashes to the porch railing and sit outside and read. 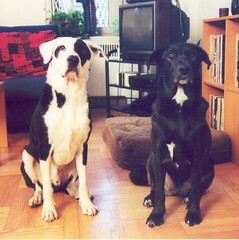 We'd go for hikes in the woods, to the flea market, or let the dogs chase either other around a school yard. 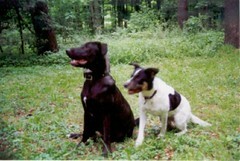 Gypsy and Clyde were great hikers – Gypsy always off the leash, the shepherd, scouting out the trail ahead, turning back to make sure we were following, Clyde always on the leash, so she didn't disappear after a squirrel. 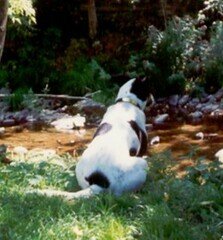 Gypsy loved the water; she'd swim in any available pond, stream or puddle. One very hot day while she was standing in a stream, we saw her briefly duck her head into the water, kind of swiping it sideways, something an animal almost never does. Clyde would walk gingerly to the water's edge, just to where her little paws would touch the water, and never go one step further. Fleischmann itself has beautiful restored Victorian houses, a very old synagogue, a run-down supermarket, and an ancient movie theatre. There’s an auction every Friday night which people come from all over to attend. It's quite the local spectacle: a barn full of beer bellies, bad teeth, black coffee and cigarettes. That’s about it for Fleischmann. We rented a little cabin near Phoenicia, New York, either here or next door at Ray’s Cabins, every year for the next five years. The cabins were tiny, but we didn’t care. The surroundings were beautiful, we could sit outside, barbecue, hike in beautiful Minnewaska State Park, pick up a fantastic brick-oven pizza from Brio’s, or watch Gypsy and Clyde chase each other around the lawn. We bought a portable dog run – a big metal corkscrew that you push into the ground, with two 25-feet tethers attached – so the dogs can have freedom but still be safe. We couldn't leave the dogs alone in the cabin – Clyde would tear down the curtains! (What a nut she was!) And there was no place to go anyway. So we spent 24/7 with the girls. They loved it and we loved it. At night, we’d sit on the tiny front porch and listen to the Yankees on the radio, the dogs sacked out at our feet. Lovely memories. At some point the Fourth of July weekend expanded to a full week, and we managed to do that and still take what I call a "real" vacation, meaning traveling somewhere. We'd take the dogs ahead of the holiday weekend rather than after it. After July 4th it actually got a little crowded, families from Brooklyn, a lot of noisy kids. I remember one year at Ray's some children fell in love with our dogs, all they wanted to do was pet and hug them. Their parents kept apologizing and thanking us for being so tolerant. The parents must have told the kids not to go over to our cabin unless we invited them. First thing in the morning, the kids were standing on their porch, leaning forward, staring bullets at our cabin, waiting, waiting... I barely got the words, 'You can come on over' out of my mouth before they were all over the dogs. In the summer of 1998, driving home on the Thruway, the dogs sleeping peacefully in the back, I started to cry, knowing it was our last summer together. Allan didn't want to believe it, but I knew our aging Gypsy wouldn’t make it to the following summer. Turns out she didn’t see the end of the year. That November, just a few weeks shy of eleven years since we adopted her, she gave up her fight and we had to let her go. I still cry thinking of it. I guess I always will. 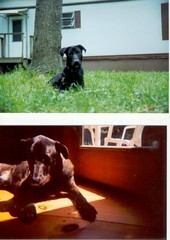 In 1999 we stayed in a trailer with Clyde and Cody. We never dreamed it would be Clyde’s last summer. We adopted Cody in April, went upstate in July. In August, we did our "Midwest rust belt" baseball tour. While we were gone, Clyde became fatally ill. She hung on til we got back. More on this story some other time. These trips upstate meant so much to me. When I was a kid, my family took three-week vacations, traveling trips I remember very fondly, and I went to camp. On my own, I sweated through sweltering city summers, first in Philadelphia then in New York. Once Allan and I lived together, we would spend summers hiding in the air-conditioning, going outside as little as possible. Being able to rent a tiny cabin – being able to give my dogs some country life, even for a week – and still being able to travel in the same year, was a luxury to me, something I never thought I'd be able to do, and deeply appreciated. 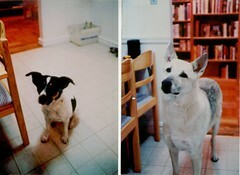 By the summer of 2000, our family had completely changed: we went upstate with Buster and Cody. Buster was completely freaked out by being in a new place. Our first time up there, he screamed and cried for hours. Hours – and we were right there with him! My god, what was done to this poor animal that he fears the world so. The following summer he was much better – still anxious, but much improved – and now as long as we’re all together, he’s fine. Thanks to training, medication and years of stability, he’s really come such a long way. In 2001 and 2002, we got a larger cabin in the same place. 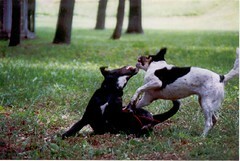 Even though Buster can never be off his leash, being on the run, tussling on the grass with Cody, was so much fun for him. It made me so happy to see it. But it wasn’t easy to bring Buster to the Phoenicia cabins. There are always other dogs around; we always had to be so vigilant, constantly running him back into the cabin to avoid a meltdown. We were outgrowing the little cabins anyway, and then they went out of business. This led to a major upgrade: last year we rented a great house for an entire month. My sister was able to lend us a car, and because we didn’t have to rent, we were able to stay for all of June. Yay Judy! June 2003, our tenth year in the Catskills, was a magical month for me. First, to get out of the city for a whole month (we would just come back for work on the weekends) was incredible. Second, to have a whole house, with a fireplace and a lawn, a loft bedroom, a big kitchen – wow, what a luxury! The house is completely surrounded by woods, only accessible up a steep gravel drive. Which means… no other dogs around! Buster was able to stay outside all day. We even let them off the run completely, so they could chase each other around the house – literally, in a giant circle around the outside of the house. It was the first time Buster was able to play outside off the leash since we learned of the (ahem) potential consequences. That was really special. On Friday afternoons we’d drive back to the city, then after work on Sunday night, around 10:00, we'd throw the dogs in the car and go, get to the house around midnight. We'd listen to the end of the ESPN game on the way up. Once we were off the highway, we'd have to keep a sharp eye for deer; we'd usually see at least 4 or 5 on the way to the house, their eyes shining in the headlights. Can you imagine how ecstatic the dogs were on Sunday nights? The first week we didn't go, they were staring at me. Mommy, aren't you forgetting something?? Major guilt! This house is beautiful and comfortable – exposed beams, a big fieldstone fireplace, a loft bedroom, 360-degrees window. Since it's surrounded by woods, when you're inside, everywhere you look, you see green leaves. Upstairs, you wake up to sunshine and green trees. It's a short, pretty drive from an excellent grocery store so I can make great dinners and we don't have to go anywhere, and it's much closer to Minnewaska, my favorite place to hike. We also hiked in the Shawangunks, took a "history hike" in the Mohonk Preserve and saw the remains of the Huguenot community that originally settled New Paltz. The tiny village of High Falls has an old tow path, and the ruins of an aqueduct designed by John Roebling. There are tons of historic places in the Catskills. But even though we both love history, and I especially am interested in local history, we've never done most of it – because we're always there with our dogs. This year we're renting the same house for 2 weeks, missing one weekend of work. And this time, my brother and sister-in-law have a car we can use! Let's hear it for siblings! We're going in September, so it will be a little cooler and hopefully we won't be besieged with mosquitoes like we were last year. I hope it will be cool enough so I can make a fire every night. Anyway, I'm very excited about going this year, especially since this is our only vacation for the year. 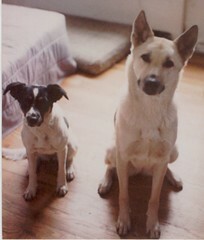 I'm not at all sad that it's our last summer, but it does bring back a flood of memories about Gypsy and Clyde. 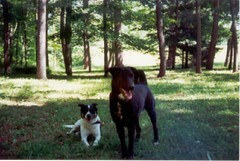 We're going to take some of their ashes up with us and scatter them in Lake Minnewaska, Gypsy's favorite place to swim. At some point I'll blog about all our dogs, their personalities and what made each of them special, and how each one came to us. For now, I'll just say they are always present in my memories and my heart. The girls. 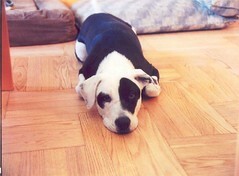 My beloved Gypsy, my best friend (before Buster), so smart it was scary, and a real devil! 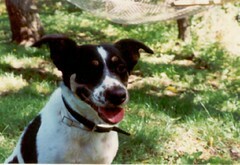 And Clyde the Dog, little speckle-snout, sweetest dog in the world. Miss you guys.